The highly compact and lightweight Canon XA55 offers high quality 4K UHD image with beneficial features such as Dual Pixel CMOS AF, Canon 15x optical zoom lens and advanced Full HD image quality driven by utilising outstanding Over Sampling HD Processing. Optimize the quality of your images with an ultra-wide 25.5mm 4K 15x optical zoom with Super UD lens elements to minimise chromatic aberrations. There is an advanced 5-axis image stabilization to cope with filming on the move or when shooting handheld. Canon XA55 incorporates Dual Pixel CMOS AF for fast and accurate autofocusing in approximately 80% (vertically and horizontally) of the sensor. Face detection AF and Touch tracking operation enable seamless focus control for intuitive operation. A Dual Pixel Focus Guide provides a graphical interface to aid manual focusing. 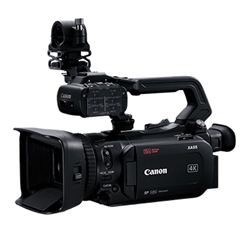 Canon XA55 supports multi-format recording capabilities including XF-AVC and MP4. It records XF-AVC 4K UHD 160Mbps up to 25P, plus Full HD 45Mbps at 50P/50i/25P. It is also possible to record MP4 4K 150Mbps at 25P and Full HD 35Mbps at 50P/25P. Slow and Fast motion recording are also possible in 4K/Full HD up to 1200x.